November 2018: here are some stories from some of the clients we met during our recent visit. Emily:Emily’s husband ran away and left her with 5 children aged between 13 and 5. The family was destitute. Speaking of her life before the loan, she said ‘we had nothing, we suffered’. Now that she has learned to make rosaries and other beadwork, she is using her loan to make and sell these and other small religious items outside churches and retreat centres. Each week she is earning enough income to pay for food, rent, school fees and uniform and she also manages to save about 200ksh (£1.50) per week in her table banking group. Lucy: Lucy already had a very small plant nursery when she borrowed 10,000Ksh(about £75) in June 17. She used the loan to expand , and having repaid on time, borrowed 20,000Ksh in July 18. She used this loan to rent more land and to buy a greater variety of plants. She buys seedlings to grow on, and also raises plants from seed or cuttings. She is experimenting with vegetable plants this year. She employs two workers full time, and also pays the watchman at the petrol station opposite to guard the stock at night. Lucy is using her improved income to pay for school uniform and better food, and has also built up some emergency savings.She is pleased with her progress so far and has big plans for the future. Mary: Mary is 74 and provides for her 5 orphaned grandchildren aged 18,16,14,12 and 8, all of whom are still at school. Mary is a hawker of second hand clothes, walking several miles a day carrying her stock. She says hawking enables her to reach more customers. She has repaid her first loan on time and took her second loan in July this year.Both her loans have been used to add stock. She buys piece by piece in the local wholesale market, at Kibuye. Her daily profit has doubled, she says, because she can afford to buy better pieces of clothing now. She enjoyed the training because 'everyone was treated as equal' and because care was to make sure she had fully understood every topic. The best learning for her was to keep a notebook of debtors so you don’t forget who owes you money. Mary spends her extra income on school fees, uniforms and school lunches for her grandchildren; she also saves in her table banking group. Mary says life is ‘so much better’ even though her head is now very busy. Loice:Aged 34, Loice is a widow with 6 children aged 15,12,9,6 and twins aged 4. She lives in a rural village just outside Kisumu.Before she received her first loan (10,000Ksh in June 18), she earned money by digging in the fields for her neighbours.It was heavy work. With her loan she has started her own vegetable garden, renting land for a year and spending the remainder of the loan on seeds. She grows green vegetables, which she sells every day at the market. She says her earnings have improved and there is much less heavy work. She is using her extra income for school fees, better meals and is also saving with her table banking group. In the future, she plans to use her savings to grow a wider variety of vegetables. In the long run she would like to rent more land and to pay others to help her tend it, to increase her sales. Loice says she now feels life is more hopeful and that she is treated with more respect. 25 new ladies successfully completed their 5 day business training in March 2017, and received small loans. 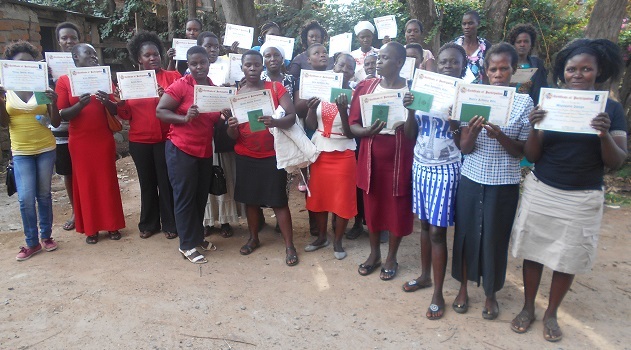 Here they are with their certificates and green loan passbooks. We visited 7 of these ladies at their places of business in May 2017. They impressed us with their energy and determination to succeed. Each one expressed improved self esteem, greater empowerment and better hopes for the future. The training and support provided by Angelina was described as essential to their progress. We were very encouraged by these meetings. In June and July, 50 more attended the 5 day training workshops run by Angelina. These formed ten new groups, had their business plans ready, and after a successful fundraising drive, all had received their loans by November 2017. Our oldest client, Gaudensia, started her new business at the grand age of 93! The types of business include fishmongers, brickmakers, market gardening, maize growing, chicken rearing, making and selling liquid detergent, ropemaking and selling peanut butter. Moses completed a free course in pig rearing, he went along. Our partners in Tanzania, JIKWAMUE, helped him write a business plan and provided a loan, which he used to rent an acre of land and buy two pigs. Within a year, he had raised and sold 30 piglets, and with the profit he bought 3 acres of farmland and a building plot for a house. Growing his own maize has cut his pig feeding costs; he also grows sunflowers to sell the oil, and rears chickens to provide more regular cash flow. He and his wife are now able to send his children to school, pay for healthcare when needed, and are building a family home. 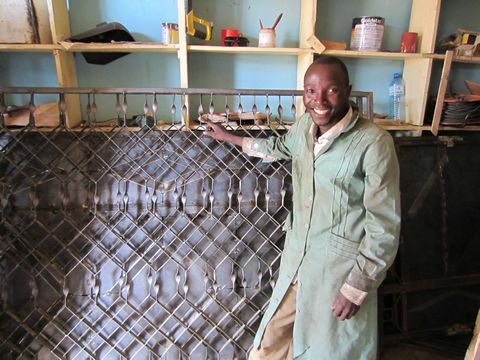 Angelo had some metalworking equipment and knew there was plenty of demand for gates, window grilles and furniture, but with no money for materials, and no prospect of a bank loan, he couldn’t get started. A small loan from JIKWAMUE, our partners in Tanzania, solved this problem; he now has a workshop and is building a successful business which now employs two college students part time. 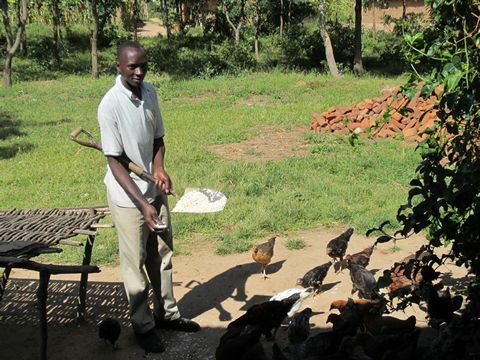 So one loan is now providing income and training for them, as well as a brighter future for Angelo and his family.